After filming TVB’s Dressage to Win (盛裝舞步愛作戰) in 2008, Carlos Chan (陳家樂) transitioned to the film industry. 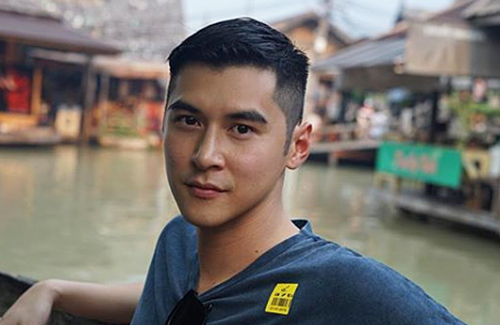 Although he had appeared in Dante Lam‘s (林超賢) film To the Fore <破風>, Carlos failed to have a career-defining role and even gave viewers an impression that he is a newcomer to the entertainment industry. A decade later, the 31-year-old EEG star can be seen in the currently-airing TVB drama, Daddy Cool <逆緣>. The drama premiered to positive reception, boosting Carlos’ popularity among viewers. In Daddy Cool, Carlos portrays the refreshing role of a man who unintentionally travels forward in time. “In the drama, I portray a man who is from the 1940s. After being frozen, I awake in the present time of 2018. Although I look like a present-day person, my demeanor and diction are that of a person from the 1940s. I had to do a lot of homework, so that the audience will believe I am someone from that era. After meeting on the set of RTHK drama A Dream Comes True <總有出頭天>, Carlos and Jennifer have been in a stable relationship for three years. The couple plans to tie the knot within five years. I found it very sweet when, last year, after a car accident that landed Jennifer in the hospital with an injury to her face, Carlos publicly declared that he will take care of her forever. I read another interview where Carlos said that Jennifer has a huge impact on him, as she has made him more grounded and he wants to start a family with her. They’re such a cute couple! As I said in the other threads, I feel like Carlos definitely has potential to become a star, since he has the looks as well as the talent, plus a good head on his shoulders. Looking forward to seeing more from him in the future. By the way, I kind of disagree with the article in that Carlos DOES have a career-defining role – in the movie Happiness from 2016 (opposite Kara Hui), which essentially put his name back on the map for HK audiences. He even said in other interviews that it is because of that movie being so well-received that he was able to get so many job opportunities the past year or so (including the invitation from TVB to film Daddy Cool). @llwy12 once upon a time Ekin also made the same declaration that he will take care of Maggie for life. Well let’s see. @llwy12 Awww, that is so sweet what Carlos said of Jennifer. Tell me something, does he have any Latino in him? Carlos looks a little bit Latino. @bubbletea Actually, I have no clue, as I haven’t found anything that talks about Carlos’ family or his personal life much outside of where he went to school in HK. He doesn’t look mixed to me but then again I’m not always the best judge of these things, lol. John Chiang can take acting lessons from him. Mannerisms spot on especially those doting grandpa scenes. He and Wayne Lai played off each other very well.